A rattle-trap motorino with a (highly collectible) old-series license plate. Guaranteed to bring a smile to any forty-something Florentine guy - who saved up to buy the same cheapo model right out of high school. Parked on a fascio-studded sewer cap. Guaranteed to bring a frown (or more likely, a blank look) to his father and grandfather - who spent their lives pretending that Benito Mussolini never existed. The Spirit of Progress was the presiding genius of Fascist Italy, which in most places meant running water and flush toilets - often for the first time. 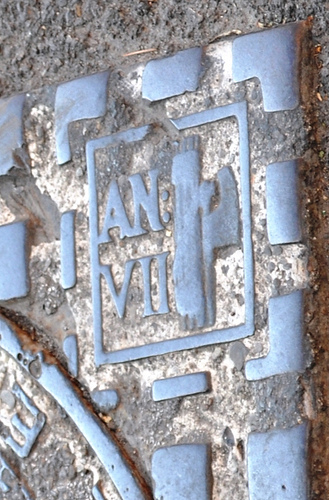 Even in relatively advanced towns (like Florence) old-fashioned sewer caps were usually stone, not cast iron. The Cult of Modern Improvements brought...well...improvements up and down the peninsula. It also brought a unique branding opportunity. 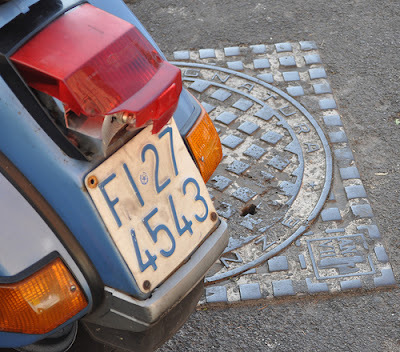 Wherever you go in Italy, you can see (or ignore) thousands of (highly uncollectible) Mussolini Sewer Caps. Right under your feet. Like portals to a strange netherworld. Or emblems of national amnesia. N.B. 1922 = Year One Fascist Era (The March on Rome: The Duce marches onto a train in Milan Station. And the rest is history...or not.) SO, 1929 = Year Seven. I love your writing ~ your description of the Mussolini sewer caps as "portals to a strange netherworld," and "emblems of national amnesia" is exactly the way I would describe my feelings when I visited the monument of Santa Cruz del Valle de los Caidos, in Spain, where Franco is entombed. It was a beautiful monument, a bit too beautiful, considering....and the strangest part was there were people placing flowers and lighting candels at Franco's tomb ~ as if he was Santa Claus or Jesus ~ very eery. Believe it or not, I actually visited the Valle de los Caidos back when Franco was still alive - but there was still enough weirdness to go around (i.e. history rewritten by the rather horrible winners). The train trip from Madrid to the Escorial took hours (through unspoiled landscapes of cork trees and buffalo) - all of which is now Madrid suburb. In 1971, I spent ten days in a grand (but then ridiculously inexpensive) hotel in Barrio Salamanca, with the Franquista elite out in full force and the social rituals very much in evidence. (I really wish that I understood what I was seeing... For me, it was just "Spain"!) In regard to children: Back in 1971, I visited the Escorial in the late spring. The town was/is a fashonable summer place, where the elite of the regime had houses and villas. Every place you looked, there were perfectly turned out governesses and nursery maids (in starched English-style outfits with caps) pushing expensive English-style baby carriages. From what I have heard, the birth rate in Italy is even lower than in Spain. When you go out in the parks here in Florence on weekends, you see all of these family clusters with parents, grand parents, aunts, uncles and one or two unbelievably spoiled kids!